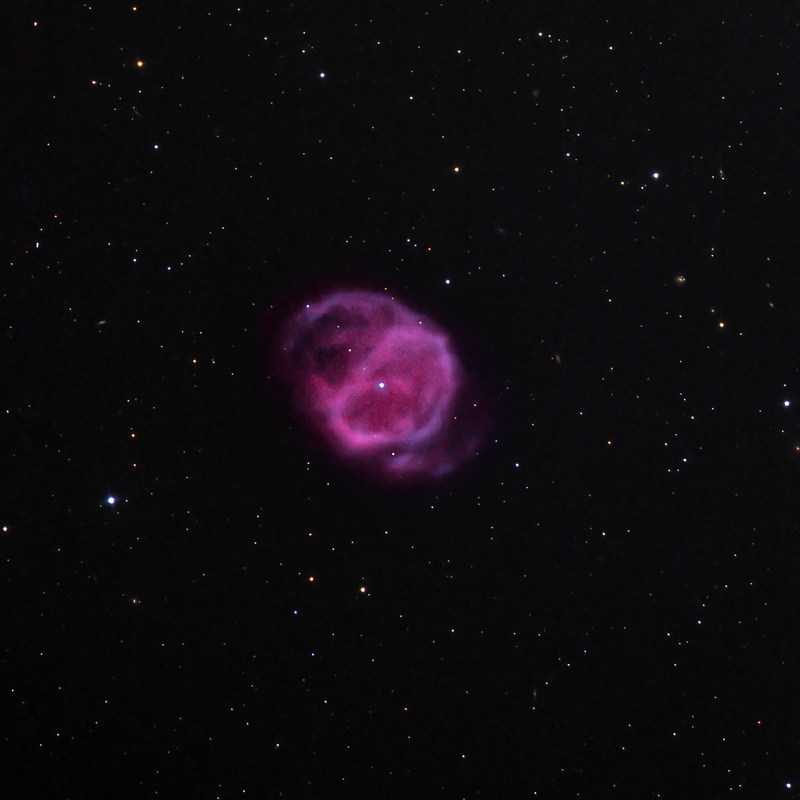 Abell 36 is a planetary nebula (PK 318+41.1) at RA 13h 41m 17s and DEC -19d 53m 10s in the constellation of Virgo. The field is 21′ x 21′ and north is to the upper left. The apparent size of the object is approximately 7.6′ N-S and 4.8′ E-W. It is estimated to be close at 780 light years distant with an age ranging from 4,700 to 8,000 years. The bright, central star in the image, FB138, is estimated to have an effective temperature of > 73,000 K. This image of the core was identified by Abell in 1966 from POSS plates. It is considered to have a bipolar structure. To me, it appears as a cylinder, tilted to our field of view, that we are looking into the interior from the opening. There is a very faint, extended, ionizing halo stretching nearly 5 degrees that was recently discovered. It is much larger than image shown above, and too faint to be seen with this equipment and exposure time. This image was composed by mapping 3 nm H-a data to red/magenta to account for some H-beta contribution to the color. 3 nm OIII was mapped to blue-green. 1 hour of RGB data, combined with G2V white-point weights, were added to the narrowband data for star colors. Stars greater than 8 solar masses are likely to end their lives in a supernova explosion, like the Veil or Vela nebulae. Smaller stars, down to about 0.8 solar masses, will likely produce a planetary nebula – an ionized and hence, visible cloud of gas surrounding a small, hot star. The star, after spending most of its life on the main branch, runs out of hydrogen to burn in its core, which becomes incredibly hot due to gravitational compression. The star becomes a huge red giant as the outer layers expand and cool. The core is still compressing and heating until temperatures reach an amazing 100 million degrees Kelvin, at which point helium nuclei start to fuse into carbon and oxygen. This process stops the core contraction. The star is now surrounded by helium- and hydrogen-burning outer shells. The red giant star is now an asymptotic giant branch star. Helium fusion tends to go in pulses, building up until they become powerful enough the eject a large part of the star’s atmosphere into the interstellar medium. The ejected material forms a cloud around the now exposed, hot core. As more of the core is exposed and the temperature reach 30,000 K, enough ultraviolet photons become available to ionize the ejected cloud, making it glow and visible to our telescopes and instruments. The cloud becomes the planetary nebula that we see. Our narrowband filters, such as H-alpha, OIII, NII and He detect this glow and highlight different structures, even from backyard-size telescopes equipped with sensitive CCD cameras. In the final stages the star heats up and then cools down to the point where it no longer can produce enough ultraviolet radiation to ionize the increasingly distant cloud of ejected gas. The star becomes a white dwarf and the nebula disappears from sight. This planetary nebula phase is relatively short-lived, perhaps only 10,000 years. It importantly seeds the interstellar medium with carbon, nitrogen and oxygen which enrich new stars in these heavier elements when they form. 3000 planetary nebulae are known to exist in our Milky Way galaxy. Although many are spherical, many others are not, taking up a variety of shapes, including elliptical, bipolar, helical and others. The appearance strongly depends upon its orientation to our line of sight. A cylinder would look different if we viewed it sideways in comparison to looking obliquely through its circular opening.